China’s repressive policies over the 60 years since it occupied Tibet, and the severe crackdown that followed plateau-wide Uprisings in 2008, have created a crisis in Tibet, provoking an unprecedented wave of self-immolations by Tibetan monks, nuns and laypeople. In January 2012 a new wave of large-scale protests broke out with demonstrators calling for freedom in Tibet and the return of the Dalai Lama. Chinese security forces responded to these peaceful protests by opening fire on demonstrators, killing at least five Tibetans and seriously injuring many more. 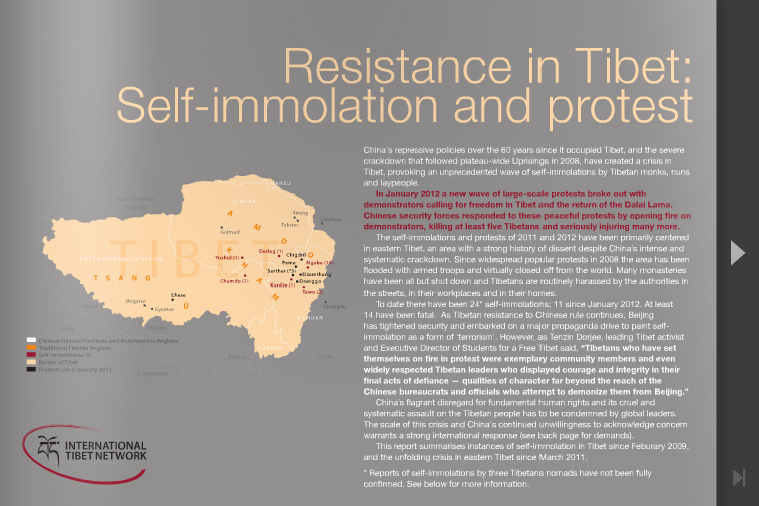 The self-immolations and protests of 2011 and 2012 have been primarily centered in eastern Tibet, an area with a strong history of dissent despite China’s intense and systematic crackdown. Since widespread popular protests in 2008 the area has been flooded with armed troops and virtually closed off from the world. Many monasteries have been all but shut down and Tibetans are routinely harassed by the authorities in the streets, in their workplaces and in their homes. China’s flagrant disregard for fundamental human rights and its cruel and systematic assault on the Tibetan people has to be condemned by global leaders. The scale of this crisis and China’s continued unwillingness to acknowledge concern warrants a strong international response. This report highlights the widespread recent resistance in Tibet and demonstrates the strong Tibetan identity and unity among the Tibetan people. ““Los idiomas no son neutrales. Ellos expresan el comportamiento especίfico socio-cultural y pensante de cada pueblo. La extinciόn del Idioma Tibetiano originarίa consecuencias desastrosas en la cultura Tibetiana. No se podrá conservar esta cultura sin él. ( )Esto es muy importante porque el Idioma y la cultura Tibetiana son excepcionalmente originales. Olvίdese de lingüística, medicina o arquitectura; solo interesémonos en la Literatura. La Literatura Tibetiana es una de las cuatro más grandiosas y antiguas literaturas en Asia, en volúmen y originalidad, junto con las literaturas Indio-Europea, China y Japonesa. El Idioma Tibetiano es fundamental para la identidad, la cultura y la religión de los Tibetianos y al mismo tiempo es uno de los cuatro más antiguos y originales idiomas en Asia. ‘Cuando los estudiantes Tibeteanos pelean por el Idioma Tibeteano’..
Actuemos Ahora!Actuemos ahora! Manda un mensaje a Qiang Wei, Secretario del Partido de la Provincia de Qinghai y Liu Yandong, Consejero de Estado a cargo del departamento de Educaciόn en Beijing para invalidar esta norma discriminatoria. Así como IHeartTibet.org esta subrayada en todo este reporte, el idioma se ha convertido en un instrumento de resistencia para los Tibetianos en Tibet junto con músicos, escritores y ahora estudiantes, quienes usan el idioma para celebrar, expresar y promover su rica y excepcional cultura. Por favor, mire y escuche “Treinta Alfabetos” de Kelsang Tenzin, es una canción muy profunda y hermosa. La letra de todas las canciones de “Treinta Alfabetos” se pueden leer AQUI HERE en Tibetiano, Inglés, Francés y Español. February 8 | Tashi Dhondup, the popular Tibetan singer, was released from Chinese prison after serving 14 months of his 15 months sentence of “re-education through labour”. Radio Free Asia reported that on his travels home he was warmly greeted by Tibetan people along the way to his home town, where his family and friends were waiting for his arrival. In celebration of this good news High Peaks, Pure Earth have posted another video from Tashi Dhondup’s album “Torture Without Trace”; “Waiting With Hope” is the first song from the album and it directly references Yeshe Norbu (The Dalai Lama). Tashi Dhondup was born into a family of nomads in Sarlang town, Yugan county, eastern Tibet (Chinese: Qinghai province). 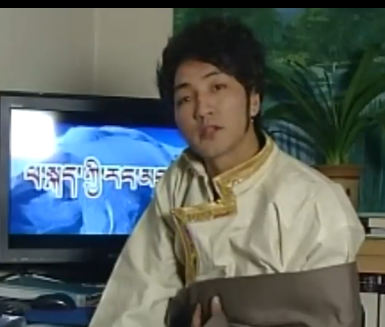 30-year-old Tashi Dhondup became famous amongst Tibetans for his song “1958-2008,” which compares the March 2008 uprising with the resistance movement against China’s invasion in eastern Tibet in 1958. The song also caught the attention of the Chinese authorities who detained Tashi Dhondup in September 2008, accusing him of composing counter-revolutionary songs. He was severely beaten by Chinese police before being released. 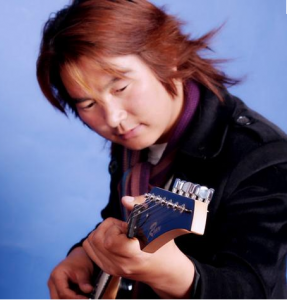 Despite previous detentions and severe maltreatment, Tashi Dhondup went on to release the album “Torture Without Trace” in December 2009. After its release he was once again detained on subversion charges and later sentenced to 15-months “re-education through labour” in January 2010. His case was not heard by a proper court but by the Yulgan County Re-Education Through Labor Committee. 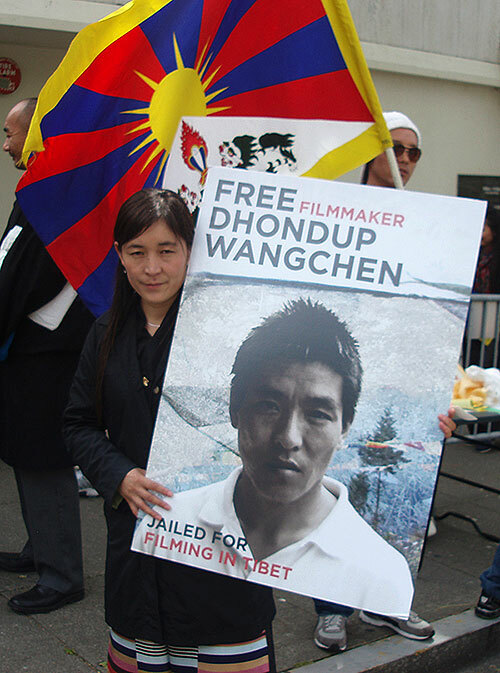 Tashi Dhondup was released on 7 February 2011 after severing 13- months for singing songs in support of Tibetan independence and the Dalai Lama. To show your support for Tashi Dhondup why not join the Facebook page ‘Tashi Dhondup’, which carries updates about Tashi and links to his songs and videos showcasing his continued brave stand for Tibetan Cultural Resistance. As a place to meet, share and exchange, the Tibetan blogosphere has created opportunities for Tibetan netizens that would be unimaginable in the offline world. Keeping in mind the state of internet censorship in the People’s Republic of China today, these new spaces can be seen as new outlets but also as new areas involving personal risk. Tibetan cyberspace has opened up a new opportunity for expression, which has also brought new risks to this community. There are several blog-hosting sites, both Tibetan and Chinese, that are favoured by Tibetans in the People’s Republic of China (PRC) today. One of the of the most popular Chinese language sites is called Tibetan Culture Net or simply TibetCul. TibetCul was started by two brothers, Wangchuk Tseten and Tsewang Norbu, and their head office is in Lanzhou, capital of Gansu Province. According to Alexa, the web Information Company, TibetCul receives over 400,000 hits every month. TibetCul is primarily a news and blog-hosting site but there are many different sections on the site related to Tibetan music, literature, films and travel. There is a BBS forum (bulletin board) and there is even a section dedicated to “overseas Tibetans”. In a similar surge of pride in Tibetan identity that featured on Tibetan blogs post-2008, TibetCul blogs featured many poems and prose articles with the title “I Am Tibetan” and new posts are being written even today. Heated discussions and debate take place on TibetCul every day about all matters of concern to Tibetans. One major example would be the online vilification of well-known Tibetan singer Lobsang Dondrup following photos posted on blogs of him and his wife both wearing fur at their wedding ceremony in early 2009. The photos were quickly re-posted across many blogs, incurring the wrath of angry Tibetan netizens and comments criticising the couple flooded the internet forums both in Tibetan and Chinese. This must all be seen in context, in 2006, after the Dalai Lama’s injunction against the wearing of animal fur, a wave of fur burning protests took place in Amdo and Kham. Hence the netizens anger and loathing for the couple. Shortly after, Lobsang Dondrup posted an apology online through his friend’s TibetCul blog. The above observations on TibetCul demonstrate the nature of cyberspace in the ability to bring people together in discussion and debate and also the ability for the online content to transcend national borders, “New Generation” has gone on to become a popular song amongst Tibetans all over the world and the “I Am Tibetan” poetry and spirit has sparked Tibetan exile groups to hold events to amplify voices from Tibet. In a paper from 2004, Tibetan scholar Tashi Rabgey referred to the Lhasa tradition of the Sweet Tea House: “Throughout the 1980s, sweet tea houses had served as important gathering places for Tibetans to exchange news, air opinions and discuss ideas.” However, “with the tightening of political controls in the early 1990s […] this unusual space of lively, open debate was brought to an end through constant surveillance.” The new virtual Sweet Tea House contains Tibetans who are literate in many languages but mainly in Tibetan, Chinese and English and Tibetans from Central Tibet, Kham, Amdo, India, USA and beyond, all in contact and dialogue. Whilst the potential for contact and dialogue in the Tibetan cyberspace is great, control of the internet and the politicisation of the blog content poses difficulties and risks. Monitoring Tibetan blogs reveals that throughout the year, at times deemed “sensitive” by the Chinese government, Tibetan blog-hosting sites will suddenly with no explanation or prior warning either be taken offline or be offline “for maintenance”. This happens typically for Tibetan blogs around the time of March 10, the anniversary of the Tibetan uprising against Chinese rule in 1959. See this link for an example of TibetCul suddenly disappearing offline and this link for Tibetan-language blogs being taken offline. Similarly, individual bloggers are in danger of being targeted by the state for blog content deemed to be dubious. 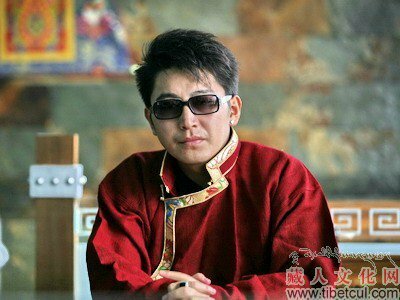 The most famous example is the Tibetan poet, writer and blogger, Woeser, who was writing two blogs, one on TibetCul and another on a Chinese blog hosting site but both of which were suddenly shut down on 28 July 2006. Woeser then had no choice but to start a new blog on a server hosted outside the PRC but has since faced a new set of problems such as server cyber-attacks by Chinese nationalists, both to her blogs and her Skype accounts. Tibetan language blog-hosting sites have been even more vulnerable than TibetCul and two previously very popular sites have been inaccessible since 2009, http://tibettl.com/ and http://www.tibetabc.cn/ The latter was particularly a great loss as prominent singer and blogger Jamyang Kyi’s blog had previously been hosted by Tibetabc but she seems to have stopped blogging altogether since the site was closed down. Two recent examples of individuals using blogs and the internet for purposes of social justice have been Dolkar Tso and Shogdung. 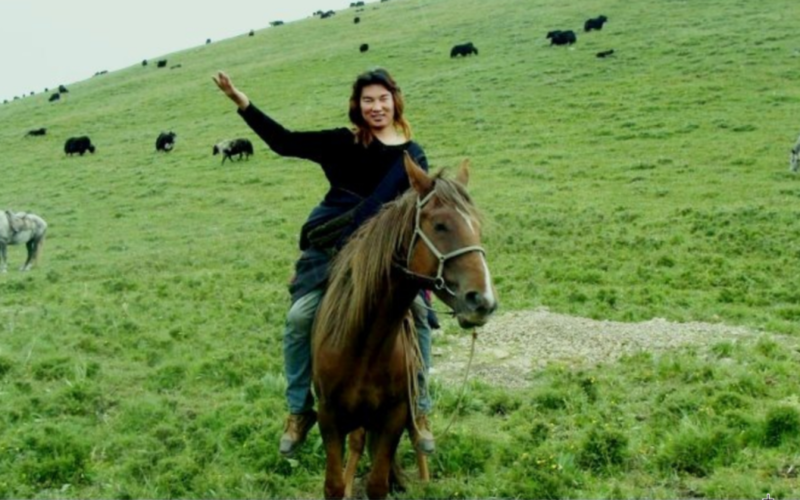 Dolkar Tso, the wife of environmentalist Karma Samdrup, was blogging almost daily in June and July 2010, documenting the events of her husband’s trial and expressing her personal feelings about the injustice of his sentencing to 15 years in prison. Amazingly, Dolkar Tso persistently kept blogging on Chinese blog-hosting site Sohu and, at the last count, is on her fifth blog as the others kept being shut down rapidly. 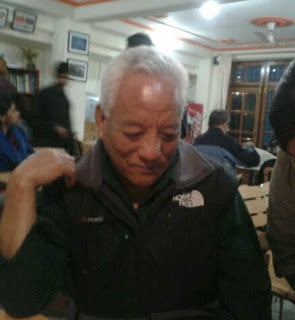 Tagyal, a writer and intellectual who used the pen name Shogdung meaning “Morning Conch”, openly spoke out in April 2010 following the devastating earthquake that hit Yushu. He, along with several other intellectuals, published an open letter on Tibetan language blog-hosting site http://www.sangdhor.com in which they expressed condolences and at the same time were critical of the Chinese government in their handling of the earthquake relief efforts. Following this open letter, Shogdung was arrested and is still facing trial. Following Shogdung’s arrest, the site Sangdhor was taken offline for several months and has only recently come back online. The last two examples of Dolkar Tso and Shogdung illustrate the importance of Tibetan blogs as sources of information and as ways to highlight injustice but evidently this comes at a great price for the individuals involved. The virtual Sweet Tea House is ultimately as vulnerable as the Lhasa tea houses of the 1990s were and is likely to remain so as long as Tibetan blogs remain behind the Great Firewall. Dechen Pemba is a UK born Tibetan, based in London. She is the editor of the website High Peaks Pure Earth, which provides insightful commentary on Tibet related news and issues and translations from writings in Tibetan and Chinese posted blogs.